Microsoft Certified Professional (MCP) candidates are required to pass one current Microsoft Certification exam(A current exam is any exam that has not been retired) that provides a valid and reliable measure of technical proficiency and expertise. MCP exams are developed with the input of professionals in the industry; the exams reflect how Microsoft products are used in organizations throughout the world. The exams are administered by Prometric, an independent testing organization with locations worldwide. You need to take a Microsoft exam from any certification track here. In other words you can choose from any exam like 70-270, 7-290, 70-291 etc. If you intend to continue pursuing a certification track after earning your MCP credential, you may want to choose an exam that will apply to that track. The MCSA program is somewhat different than the MCSE, the latter being the certification most often held by the best contractors who set up and deploy the Microsoft Server 2000 and Server 2003 technologies. Unlike an MCSE, an individual with an MCSA is an expert in operating the server technologies, is familiar with the best ways to deploy their various features and has an in-depth knowledge of the networking, security and function of server operating systems. The principal difference is that individuals with an MCSA are not typically responsible for designing the architecture or coordinating the actual implementation of a server running Server 2000 or 2003 but are, rather, concerned with keeping those systems running at their most efficient and with installing and maintaining the various components that allow a company to tailor those systems to their specific needs. For employers, the MCSA certification is a guarantee that the individual bearing it is qualified to handle just about any server administration issue. The certification, in fact, is designed to offer some differentiation between individuals who are at the top levels of the IT world. While an MCSE is usually called upon as an outside contractor to deploy Windows Server technologies, the MCSA is usually a staff person. When trying to find individuals who can fill the specific role of a server administrator, consider an MCSA certification a reason to have great confidence in their abilities. 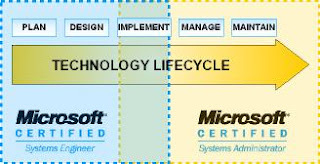 Gives me a better understanding on Microsoft certifications. Have any another blog regrading MCITP ???? May you post the latest dumps for MCP and MCSE exam?